I have always loved the simple classic elegance that was Audrey Hepburn. Whenever I see a classic black dress I think of her. 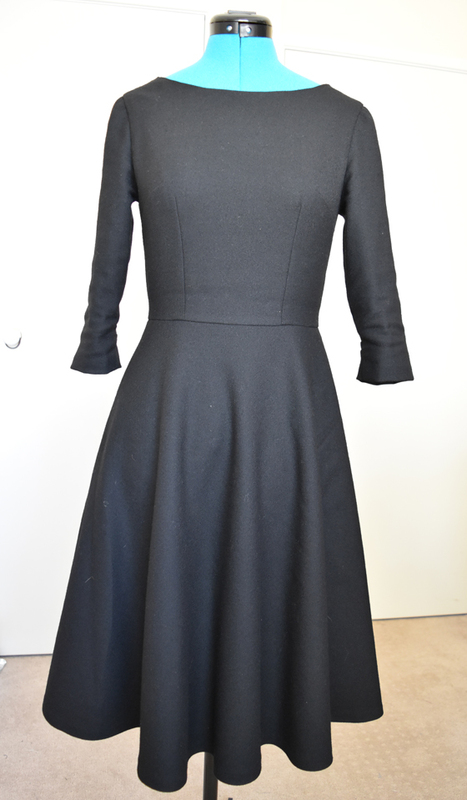 Prior to making my Anise Jacket, I wanted a classic wool dress to wear for events this winter, and it turned out just as I envisaged. 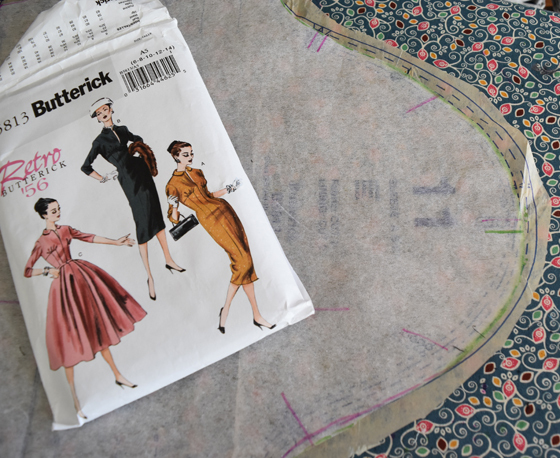 For the sleeves I used Butterick 5813, which have a wonderful triple elbow dart. This feature allow for a close fitting sleeve that still allows for plenty of movement. You can read a great post about this feature over at Iconic Patterns here. Close up of sleeve darts. For the bodice I used a combination of Simplicity 1873 (made before but not yet blogged) and the neckline of the Emery dress, which I have made before here and here. It was blowing a gale in these photos. To make sure the sleeves fit, I measured the armscye and the sleeve head, and ended up trimming a bit off the top of the sleevehead to get a perfect fit, very much like this tutorial. The Fashion Incubator post about Sleeve cap ease is also worth a read here. 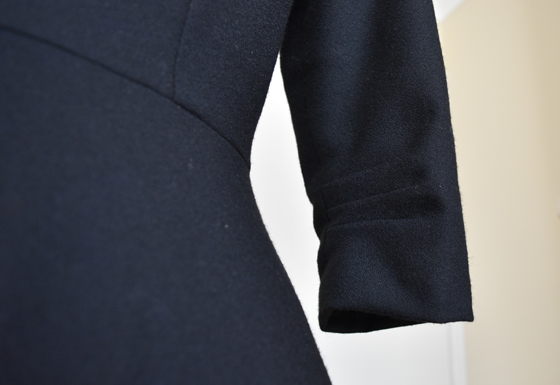 I also made a slight forward shoulder adjustment on the sleeve which you can see in the picture below the curve of the sleeve cap is pushed forward slightly, you can see a great illustration showing this over at In House Patterns. The sleeve is a size 12. 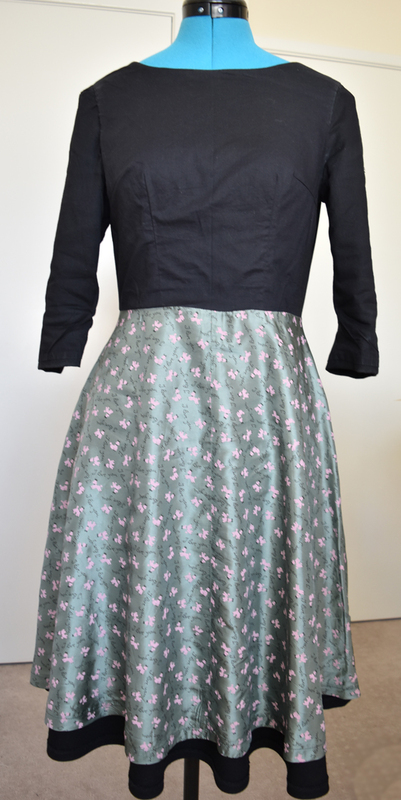 For the skirt I used a simple half circle skirt, drafted some time ago using this spreadsheet from Patty the Snug Bug, or you can use this online app from By Hand London and added pockets from whatever pattern was handy, probably the Emery. It actually was a skirt I had already made ages ago but I removed the waistband and added the bodice and pockets. I lined the bodice in cotton voile and the skirt in the same lining that I used for my Jacket (although I don’t intend to wear them together), which makes the top comfortable and breathable and the skirt silky for wearing with stockings or tights. 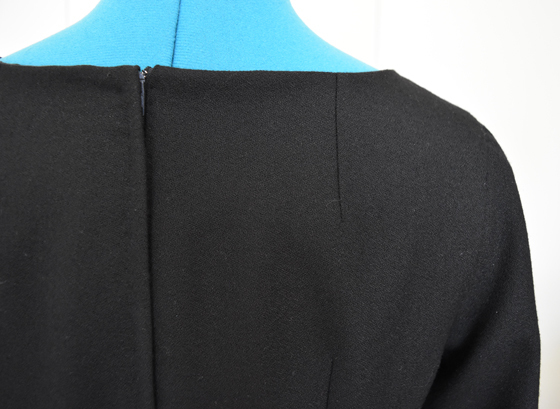 The back zipper I hand picked, I really love how the stitches just disappear on a spongy fabric like the crepe. I adore this dress. Its one of those “bucket list” dresses that I have wanted to own ever since I saw Audrey in her stunning black dress in Sabrina. I also have a new camera – my first ever DSLR, a Nikon D5500 with the 18-55mm VRII lens kit. I chose this one purely because I could use my reward points to buy it, the lens is just a “entry level” lens but a billion times better than what I have been using. It’s been fun learning how to take shots with it. It takes such clear pictures I felt obliged to (sorry, very dodgy job) blur my background in these shots so that the sign behind me wasn’t readable and announcing my address to the internet. Please bear with me while I work out what on earth I am doing but hopefully I will be able to show some improved photos eventually on the old blog.